The scalable Iowa map on this page shows the state's major roads and highways as well as its counties and cities, including Des Moines, the state capital and most populous city. To display the map in full-screen mode, click or touch the full screen button. To zoom in on the Iowa state road map, click or touch the plus (+) button; to zoom out, click or touch the minus (-) button. To scroll or pan the zoomed-in map, either (1) use the scroll bars or (2) simply swipe or drag the map in any direction. (The scrolling or panning method you use will depend on your device and browser capabilities.) At any time, you can display the entire Iowa road map in a new window or print this page, including the visible portion of the map. Iowa's primary Interstate Highways connect its major cities and facilitate travel between Iowa and its neighboring states. I-29 parallels the Missouri River, along the state's western border. I-35 traverses central Iowa from north to south, whereas I-80 crosses Iowa from east to west. Iowa's auxiliary Interstate Highways serve the state's major metro areas. I-235 provides easy access to northern, central, and western Des Moines. I-380 links Cedar Rapids and Waterloo with I-80 near Iowa City. I-680 passes north of Council Bluffs, connecting I-80 with I-29. The Loess Hills region in western Iowa is a surprising panorama of tall, grassy ridges that are best viewed traveling north from Hamburg to Akron. This 220-mile scenic route passes by the 580-acre Hitchcock Nature Center, the 4,000 acre DeSoto National Wildlife Refuge, and Preparation Canyon State Park. Sioux City, one of the country's largest grain and livestock centers, offers impressive views of the Sioux and Missouri Rivers and plenty of waterfront activities for visitors and locals alike. 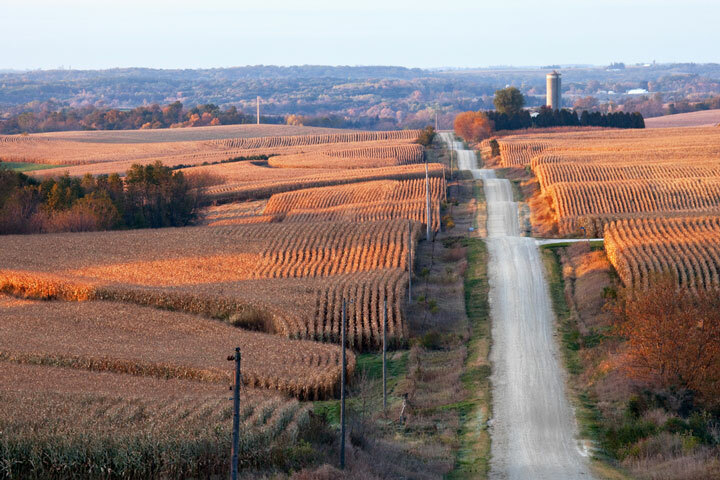 More information about scenic roads in Iowa is available on this America's Byways: Iowa page. For more information about Iowa's roads and transportation infrastructure, visit the Iowa Department of Transportation website. For Iowa road traffic conditions, visit the Federal Highway Administration's Iowa Traffic Information page.